Foods always bring me back to places, and this Basil Garlic Spaghetti Sauce is no different. This sauce reminds me of summers spent up at the cottage with my Grandmother. Lazy days spent fishing by the dock and feeding the ducks, or biking into town and splashing in the lake were always accompanied by a comforting spaghetti dinner. When the summer ended and we were no longer enjoying the freedom of cottage life, my sister and I would beg my Mom to make Grammy’s sauce, so much so that we ate it weekly. Even today, whenever I make this sauce, my sister will come into the kitchen and ask if I’m making Grammy’s sauce. 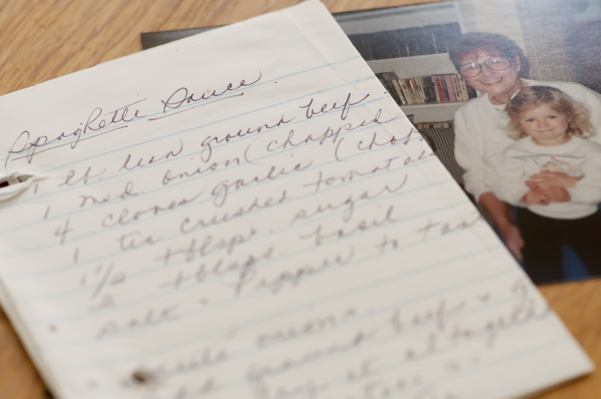 Here is the handwritten recipe she gave to my Mom years ago, that we still use today. I’ve changed just a couple of things in her recipe to have it suit me – switched out ground beef for ground turkey and took out the onion. It doesn’t effect the flavor as the sauce is simmered for an hour! Add the ground turkey and garlic, crumbling until meat is browned. Add the crushed tomatoes, sugar and basil. Bring to a boil, reduce heat, cover and simmer for an hour. After the hour, season to taste and serve over spaghetti. 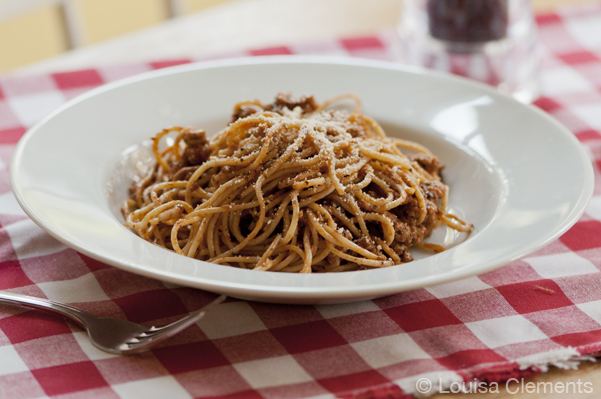 So there’s a favourite family recipe of my Grammy’s Basil Garlic Spaghetti Sauce, hope you enjoy it as much as we do. The thing I love about pasta dishes is that they're delicious and easy to make. This is no exception. Very nice!